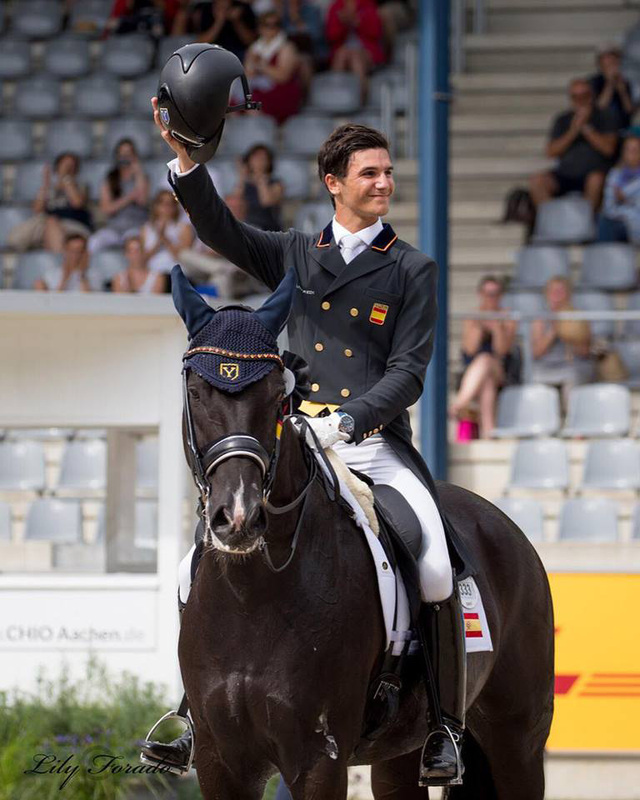 In late July, the Spanish Equestrian Federation named 20-year-old Juan Matute Guimón to the dressage team for the WEG. 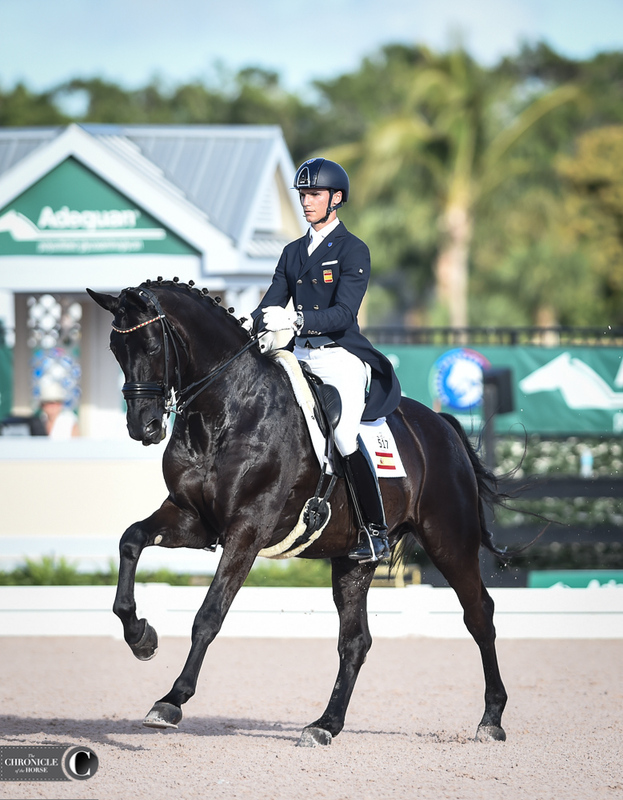 In his first world games, Guimón will ride the 12-year-old Hanoverian gelding Quantico Ymas (Fighting Fit—Dasrheen, Constant), a horse he introduced to international competition in Wellington, Florida, in March 2014. The Matute family purchased a home in Florida in 2008, and they spend every winter there training and showing. Guimón and Quantico Ymas are coming off a fourth-placed finish in the July 21 Lumileds-Preis Grand Prix freestyle at the Aachen CDI**** (Germany), Spain’s final observation event for the WEG. Guimón discusses his journey to qualification and the preparations that follow. It’s not very common, the opportunities I’ve had since I was young. Up until this point I’ve lived half my life in Spain and half my life in the States, but I feel very proud when I hear the Spanish national anthem and represent the country where I’m from. For the 2016 Olympics I tried to fight for a place on the team, but I was too young and inexperienced. At the time I didn’t end up qualifying, [but] it was still a milestone, and I improved so much in the following years. 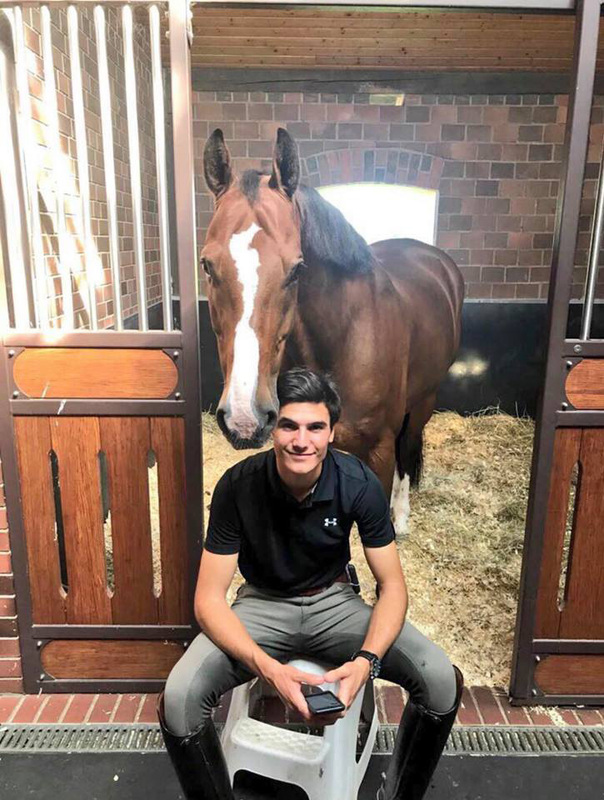 We have been mentally preparing for WEG for quite some time, and it became the goal once the U25 FEI European Dressage Championships finished last summer [in Lamprechtshausen, Austria, where he took individual bronze aboard Quantico Ymas]. Strategy and design of the season started this year, and in January, we handpicked shows that were convenient for the path to WEG observation events. We didn’t compete as much as we had in previous years. In Wellington we did four-stars, the five-star, [and] one World Cup [qualifier], and [then] a CDI in Spain. 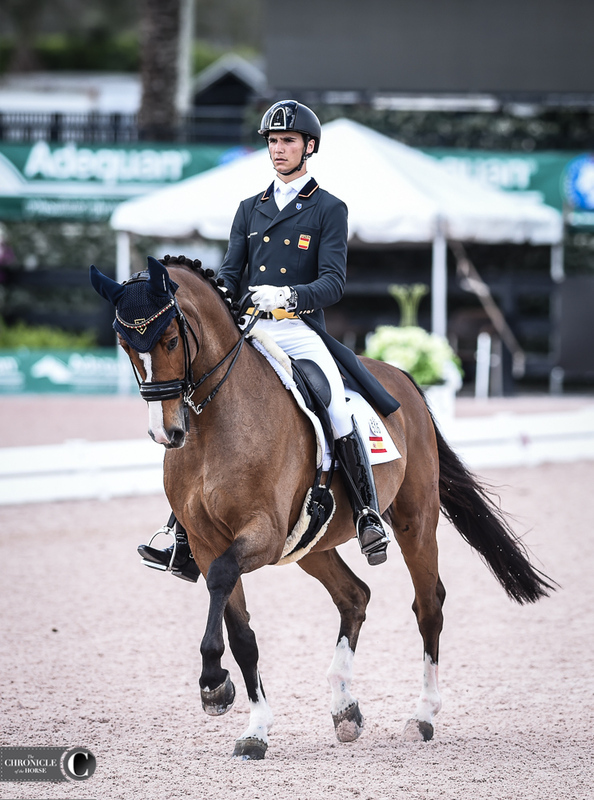 Juan Matute Guimón was named to Spain’s dressage team for the WEG on Quantico Ymas. Photo by Lindsay Berreth. [In June], the Spanish Dressage Championships were held, and nearly all team contenders were there, so we knew that, depending on the results, we would have a better idea [of] what the team would look like. We met the expectations, stayed consistent with scores, and [Quantico Ymas and I] won the bronze medal in the overall rankings. Aachen was the final observation event, and we arrived in the fifth position. We could fight for the fourth spot because [scores] were very close, so we knew that if we performed well and stayed consistent, we didn’t have to pull off anything extraordinary; we just had to do our job, and we delivered. The [Spanish federation’s] technical team could see the results, so that was clear in and of itself, but what’s more exciting is that there’s room for improvement, [and] I think that was the final vote of confidence they deposited in us. We’re very happy and thankful and really looking forward to the big meet. Now is when the real work starts, and we have to be at the peak of our performance. Don Diego Ymas (Don Frederico—Wie Platine, Wolkenstein II) is 15 years old, and he continues to teach me every day. It’s hard to believe that after so many years together we’re still finding out new things, and there’s room for improvement even though we’ve improved tremendously over the past six years. It’s very emotional because I started my international career [with him] in juniors, and he’s [my] reserve horse for WEG. It’s something to be very proud of and thankful for because he’s the main horse that taught me everything I know. Don Diego Ymas taught Juan Matute Guimón everything he knows, and he’ll be Guimón’s reserve mount for the WEG. Photo by Lindsay Berreth. Quantico Ymas, even though he is younger, has more quality. Don Diego has a huge heart and gives his best, but Quantico has that, plus more quality in the paces and a bit more sensitivity. They’re two completely different types of horses. Don Diego is more classical, cold [and] a typical German warmblood—very steady and clear. When you look for a special horse you want to find something a bit more sensitive that thinks [for] themselves and [can] also take also some direction. When you find this balance, that’s when magic [happens], and that’s what the audiences and judges look for. Quantico has this. He gets very hot and sensitive, so he’s always challenging. In Aachen he was a bit nervous because it’s a big atmosphere, a big stadium and a lot of people; you can feel the electricity in the air. It’s not easy for him, but because we know each other so well, in those types of situations we’re really able to find the connection and ride through tension. When you’re able to manage this it becomes positive tension, [and] that’s when big quality comes into play; it’s clear to have chosen him [for WEG]. My father [Juan Matute Sr.] is my trainer and mentor, and Rudolf [Zeilinger] is the national trainer. At specific [observation events] he keeps track of the progression of each horse-and-rider combination. He does clinics where the listed riders go and train for one or two days every other month in Spain; this is called the elite training program. He was at the Spanish Championships, and when I was riding in Aachen he was there giving us advice, some training tips and perspectives. I’ve had some lessons with him as well. I think this is very valuable because it’s good to have different perspectives [and] hear the same concept from a different voice. 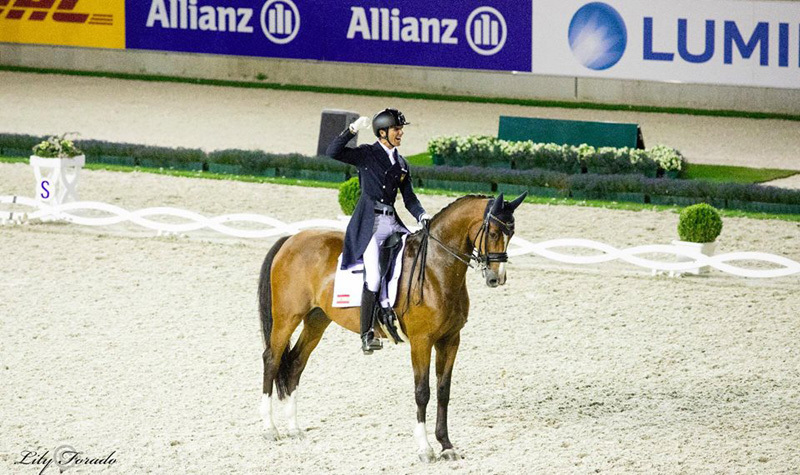 Juan Matute Guimón is looking at the long road beyond this year’s World Equestrian Games. Photo courtesy of Lily Forado. With WEG right around the corner, we have one month where I’ll train every day with my father, and [Rudolf] is a few hours away from where we’re stabled, so he will come once or twice a week to see how we’re training and progressing. [For] three days in September we have the official training camp for team members. We [will] train together and prepare [to] go to WEG at the peak of our performance. [My father and I] love each other to death, [but] when we’re training we’re both very demanding of each other. We’re very stubborn, and we’re both perfectionists; these are great quality traits to have, but they can be challenging when working together. He’s so patient, and for the most part it’s me because I talk back—not in a bad way, but I like to share every step of my riding [and] what I’m feeling. Spending time with Quantico! Photo courtesy of Juan Matute Guimón. My issue is that I try to process and understand in the heat of the moment. Instead of going home and [coming back] tomorrow to try to do it again, I want everything when I want it, and that’s a bit of a limitation. I am a bit closer to what the ideal balance should be but still very far away. I must continue to work at this because it’s my strength and my weakness. It’s my first WEG, so I want to leave Tryon with a smile on my face, [and] I hope to feel proud of my work and pleased with my presentation. This is a milestone for me, a huge accomplishment, yes, but it’s a stepping-stone, a learning experience and preparation for Tokyo 2020; that’s the ultimate goal. Unfortunately, we don’t know how many more Olympic Games the equestrian sport will have. I want to continue the legacy of my father, [and] I would hate to be the son of the Olympic rider that—because the sport was no longer in the Olympics—wasn’t able to be an Olympian as well. Our sport is very elite and exclusive; not everyone understands it or appreciates it as much as we professionals do. Dressage is pure technique, and if you don’t understand it then you get bored after a while. This is the equestrian world; not many people can access it, and therefore not many people can enjoy the beauty of it. At the end of the day, if you can’t do it yourself then you can’t appreciate it as much if you’re just watching. I’m on the more optimistic side of the coin; there are a lot of people working really hard to innovate [and] improve our sport to make it more attractive to newcomers. Juan Matute Guimón hopes the keep equestrian sport in the Olympics, so he can follow in his father’s footsteps. Photo courtesy of Lily Forado. I’m working with the FEI quite closely, [and] I went to their headquarters in March [for] their Sports Forum; I was the representative for dressage. The FEI is concerned, so they brought [together] a panel of young riders [to] give our opinions on certain things. It was a valuable experience because it made me aware that the FEI really is concerned with the future of the sport. Together we are going to build a better tomorrow, a more modern and attractive feature version of our sport. The sport shouldn’t change, [but] we must change the perspective that we give to the people observing from the outside.